WARNER ROBINS, Ga. (AP) — Sitting on the wooden pews of a small white brick church on a hot Wednesday afternoon in central Georgia, a group of residents gathered to chat about the upcoming governor’s race and the issues concerning them in their community, from economic development to health care to infrastructure. A particular topic of interest was a strategy for voter turnout — and how to fight the barriers to it — in what could be a pivotal midterm election. These were not the rural voters who have gotten so much attention after helping elect President Donald Trump in 2016. They are the black rural voters living in red states. They’re staunchly Democratic even as they’re surrounded by white voters who are almost all Republicans. And they’re often overlooked by big-name candidates from both parties. The Black Belt’s overlap with Trump country could factor into the elections across the South next month, including competitive races for the governor’s mansion in Florida and the Senate in Mississippi. That raises the possibility that black rural voters will have an unusual opportunity to make an impact on statewide races. But it’s Georgia where black rural voters could be especially important as Stacey Abrams campaigns to become the nation’s first black female governor. A Mississippi native who moved to Georgia as a child, Abrams is the first Democrat in years to have a real chance of winning the governor’s race. And from the beginning, when she launched her campaign in south Georgia’s Dougherty County, she’s made outreach to rural voters a key part of her strategy. “Since the beginning of the campaign, Stacey Abrams has been focused on reaching out to a broad coalition of voters in every part of the state, including rural communities of color who have been left behind for too long,” said Lauren Groh-Wargo, Abrams’ campaign manager. 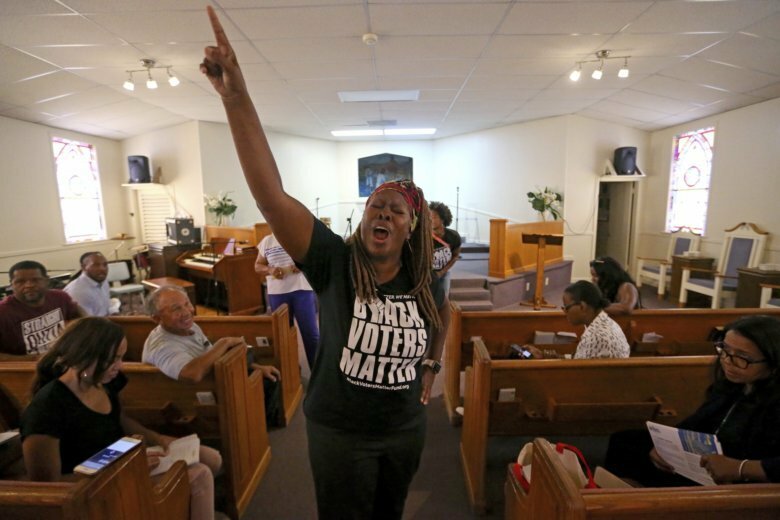 Statewide, a third of rural Georgians are people of color, and Abrams has been making her case to black rural voters in churches like the one in Warner Robins. In recent months, she has spent time in towns like Riceboro, Americus, Thomasville, Fort Valley and Cordele — far from the usual Democratic campaign stops like Atlanta, Savannah, Macon and Albany. During the primary, Abrams’ efforts paid off in places like predominantly black Washington County, where she campaigned in May. Turnout there nearly doubled from four years earlier, with Abrams getting 69 percent of the vote this spring, according to turnout data from the Georgia secretary of state. Rural blacks’ priorities often differ from those of their urban counterparts. Many suffer from health disparities, including obesity, maternal mortality, diabetes and sickle cell, living in regions with few hospitals, governed by state officials who have rejected the expansion of Medicaid that would help them afford treatment. The Black Belt was historically an agricultural region that remains starved for economic development, and the class and power divide that began during slavery still persists along racial lines in many communities. While the Civil Rights Act of 1964 and the Voting Rights Act of 1965 politically changed the region with the onslaught of black public elected officials, another result was voter suppression, said Georgia State University historian Maurice Hobson. That dynamic has paralyzed some blacks in the South, but this fall’s midterms could signal a shift among those voters and a way forward for Democrats seeking their votes. Kattie Kendrick, former Peach County Democratic Party chairwoman, who was on a recent tour stop in Fort Valley, Georgia, said that mobilizing voters in her part of the state has been challenging but that outside interest could help to energize them. “We do not necessarily unite, but when other people know that the black people in Peach County and throughout rural Georgia matter, that makes a difference,” Kendrick said. Down the road in Terrell County, the Rev. Ezekiel Holley plotted how to get nearly 1,000 of his neighbors who typically vote in presidential elections to show up for the midterms. Nicknamed “Terrible Terrell,” three churches in the county were burned in the 1950s to keep blacks from voting. Today, Holley said, the problem is apathy and frustration with elected officials who forget they can’t see a doctor or need their roads paved. “The majority of the national politicians feel that … they don’t have to worry about little rural places. Most folks are concentrating on metro Atlanta more than the rest of Georgia. Hopefully they’re getting the picture now,” Holley said. Holley went to see Abrams speak at a campaign event earlier this month with former President Jimmy Carter in his hometown of Plains. The pair talked about Medicaid expansion, which Holley believes will bring jobs, better health conditions and industry into the state. That she announced her plans there said to him that she cares about his corner of the state. It’s a message Holley plans to take to the registered voters he hopes to help turn out in Terrell County in the coming few weeks, but he’s still not sure whether they will show up. This story has been corrected to show that state officials have rejected the expansion of Medicaid, not Medicare.